A store event will be held at Aerosoles organized by the Womens Collaborative, on Tuesday 9.30 from 5pm. I just found out that that there will be an additional 25% off on all boots and all guests will receive a 15% discount for life! Not to miss! Btwn: 21st & 22nd Sts. The Housing Works Annual Open Air Book Fair give you then chance to sort through tens of thousands of old books, records, and CDs. Collect those hidden gems for merely $1 and then hibernate for the winter with your new stack of used books. There is also clothing sold by the bag. 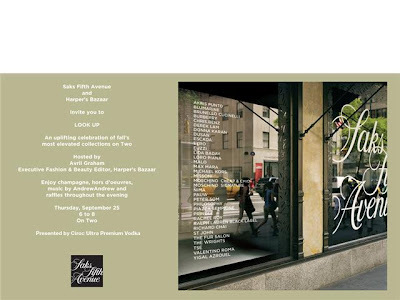 Don't miss the event at Saks Fifth Avenue, Thursday, 9.25 at 6pm on Second Floor. Enjoy canapes and champagne and the new Fall Fashion trends! Click on the invite for details! A riveting collection of photographs of some of the world's most influential political and pop culture figures spanning 40 years opens at the Morrison Hotel Gallery's Soho Loft at 116 Prince Street in SoHo on Sept. 25 from 7pm - 10pm. This exhibit marks a departure for Morrison as it includes subjects mostly outside of the musical realm. Scherman's photographs captured with a hand-held Leica camera take a close and intimate look at a pivotal time in US history. 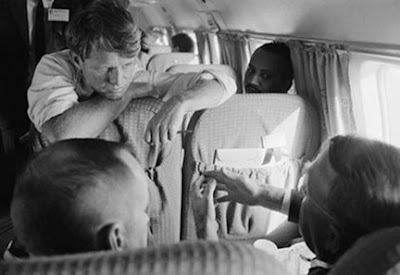 In this current election season weighted with history and significance these photos take on an added resonance. A chilling shot of Jimmy Hoffa after his conviction in 1964, photos of Robert F. Kennedy strategizing with campaign advisers in 1968, and pictures of Bob Dylan at the 1963 Newport Folk Festival are all featured in the exhibit. 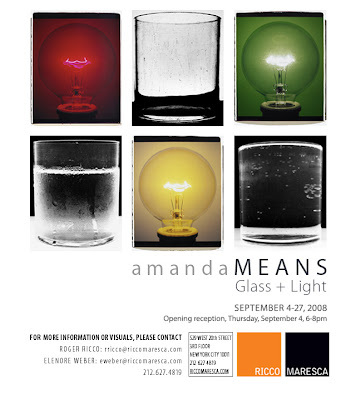 The exhibition and sale will run through October 12th. Real Pilates is hosting a super-fun fashion event with friend Kathlin Argiro on Wednesday, 9.24. 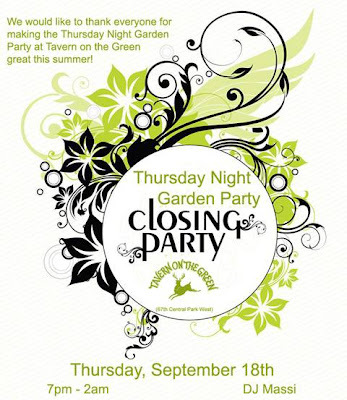 Join Equinox gyms for the autumnal Equinox party! 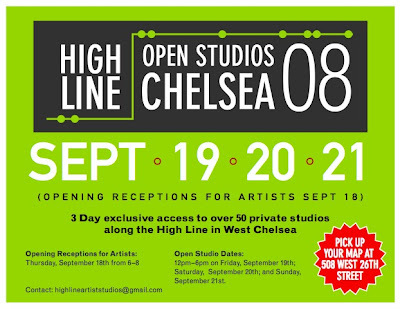 The High Line Open Studios event kicks off today, Friday, September 19th, and continues the whole weekend. Go to 508W 26th street (between 10 and 11 Avenues) to pick up a map. It's free and open to the public! The Arm Candy party is only five days away! 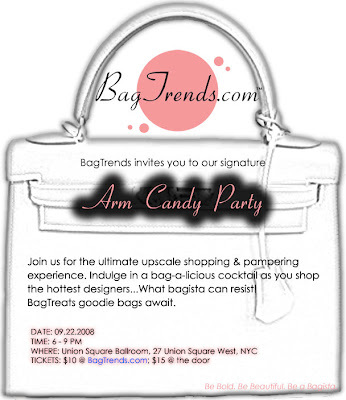 Come have some bag-a-licious fun at The BagTrends Arm Candy Party September 22nd @ the Union Square Ballroom in NYC. Join other divine bagistas – fashionistas with a perchance for fine purses - for an exclusive and fun shopping and pampering experience...and do it all with a bag-a-licious cocktail in your hand. Don’t miss the chance to be a part of this luxurious shopping party. Visit http://www.bagtrends.com/events_armcandyparty_sept2008.htm to buy your ticket. It's just $10! Can you do fashion in a budget? Apparently, you can. Wearing T-shirts saying "Thrift is the new black", the staff of Housing Works made their point. This was the message of the 5th anniversary bash of famous blog http://www.thebudgetfashionista.com/ held at my favorite thrift store “Housing Works” on Monday September 8th. Amongst celebrities who attended was “How to look good naked” host, Carson Kressley who supported discounted stores and even said that he shops at Century 21. Jess Zeno, co-host of “Modern Girls Guide to life” opted for Forever21 but admitted that her favorite designer is Moschino. Actress and model Roshumba Williams pointed the elegance and importance of accessories and Dee Vasquez, host at the Fuse Network talked about sales and comfort. “Thrift, thrift, thrift” were the three words Kathryn Finney, the founder of the Budgetfashonista.com insisted on. Kathryn, a shopping guru who advises daily her readers on how to be elegant and fashionable without breaking the bank, admitted that she would love a Tracy Reese dress one day but in the meantime her favorite stores are Payless, RightFit and Primark (in London). There was of course cocktails and canapés, music and goodie bags for the lucky ones filled with Kathryn's favorite things. So despite the glamorous Fashion Week, thrift and sales are the big winners: be beautiful and smart and keep your credit cards healthy too. I wonder though: Can the "buying cheap" motto actually help the economy and create local jobs? And is "buying cheap" eco-friendly? 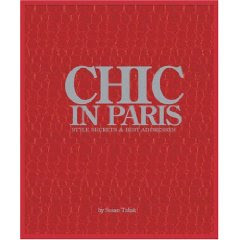 La Maison du Chocolat invites you to the presentation in New York of Susan Tabak's book CHIC IN PARIS. The author will share her Parisian tales and tips with the audience and a chocolate tasting will follow. On September 15, Vanity Fair will launch Campaign New York with a one-night-only cocktail and shopping event—organized in partnership with the Madison Avenue BID and open to the public—up and down the avenue. When you use your American Express® Card, 10 percent of the proceeds from the evening's sales from all stores will be donated to the Whitney Museum of American Art's Photography Program, Collection, and Special Exhibitions. 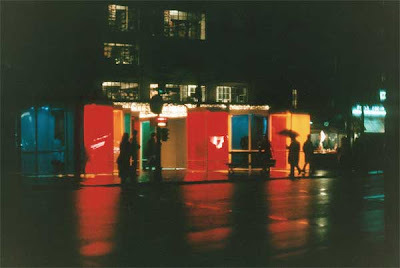 The event will celebrate the opening of the "Unveiled" Exhibition, curated by Vanity Fair, with the Whitney Museum: From September 15–26, more than 95 Madison Avenue BID members will feature images from the book Vanity Fair: The Portraits, A Century of Iconic Images in their windows. Select stores on the avenue also will feature a Cardmember item specially selected for the Campaign New York celebration. From September 15–26, when you purchase these items with your American Express Card, 10 percent of sales will be donated to the Whitney Museum. For more information, special events organized by American Express and Nespresso and RSVPs, visit: http://www.vfcampaignny.com/unveiled.asp and look at the left side menu in purple! Have some fun - it's still summer! The Fashion Week ends today but this can't stop you from attending a Fashion Week afterparty! The Rioja Fashion week afterparty is happening tonight at Owl's Lab Boutique and starts at 6pm. 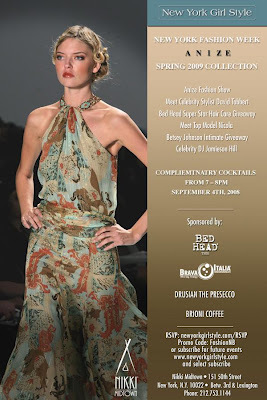 Sip Rioja wine with Project Runway designers and have some fun celebrating the end of this crazy week! Paragraph is thrilled to host a reading with writers Richard Todd and Andrew Sean Greer at Clay, followed by a wine and cheese reception at Paragraph. The event is free and open to the public. Books on sale provided by Mobile Libris. Richard Todd is the author of The Thing Itself, hailed by Ward Just as a "a splendid book, brimming with wit and original insights." Richard has spent many years as a magazine and book editor at The Atlantic Monthly, The New England Monthly, Worth, Civilization, and Houghton Mifflin, and he now works independently as a consultant. He has written scores of articles on a wide range of cultural themes for Harper’s, The Atlantic Monthly, The New York Times Magazine, Condé Nast Traveler, and the Columbia Journalism Review, among others. He is a professor at Goucher College. Andrew Sean Greer is the bestselling author of The Story of a Marriage, which The New York Times has called an "inspired, lyrical novel," and The Confessions of Max Tivoli, which was named a best book of 2004 by The San Francisco Chronicle and The Chicago Tribune while garnering many other coast-to-coast honors. His ﬁrst novel, The Path of Minor Planets and his story collection, How It Was for Me were also published to wide acclaim. His stories have appeared in Esquire, The Paris Review, The New Yorker, and other national publications, and have been widely anthologized. He is the recipient of the Northern California Book Award, the California Book Award, the New York Public Library Young Lions Award, and fellowships from the National Endowment for the Arts and the New York Public Library. Greer lives in San Francisco. We often talk about high heels, designers' shoes and Prada but do we really know what makes shoes comfortable, easy to walk and a good choice for our foot's health? Learn more about footwear tonight 9.11 at Eneslow, Park Avenue South @ 32 street. Click the picture for more details! Some of you may know that I am working on a book entitled GET INVITED: all you need to know to be on the guest list and tell others who aren't! If you want to help me with my research, spare a few minutes and take the survey by clicking the link below. This season's events, openings and lectures kicks off tonight at the Americas Society. Find the details below. For regular updates click on http://as.americas-society.org/calendar.php. Americas Society presents Carlos Cruz-Diez, one of Latin America's Kinetic art masters, in his first solo show at a major United States cultural institution. Focusing on the relationship between color and perception, the exhibition seeks to correct the limited understanding and visibility of Cruz-Diez's work in the United States. Every fall, Housing Works Thrift Shops completely empties its stores and restocks with first-rate merchandise that we've been saving all summer. Then HW organizes its Fall Preview sales where you get first crack at the unbelievably cool stuff. Zuyapa is wearing a red cocktail dress by Tadashi for $100 and L.A.M.B. pumps by Gwen Stefani for $60. Also pictured: a club chair with silk upholstery for $300, a hand-blown Swedish vase for $65, an 18th century-style breakfront for $1100, and a Judith Lieber clutch for $300. Bring a donation in your Housing Works Tote and get in free or its $10 at the door. Better yet, donate $500 and get VIP Access. You will learn more about stores and VIP Access benefits too! If W is your favorite magazine, then don't miss the event at Bloomingdale's tomorrow, Tuesday! Saks Fifth Avenue invites you to join us as we celebrate the fifth iteration of our world-famous WANT IT! campaign with the artwork of French Illustrator Alexandra Compain-Tissier. Come shop the Fall season's hottest trends while you enjoy designer personal appearances, vendor specialists, informal modeling, refreshments, music, and much, much more throughout the store. Don't Settle. Customize. Saks Fifth Avenue invites you to join us for the Fall 2008 Polo Ralph Lauren Made-to-Measure Trunk Show. For more information, please call 212.940.2798. Saks Fifth Avenue invites you to join us for the Fall 2008 Armani Collezioni Made-to-Measure Trunk Show. For more information, please call 212.940.2798. Don't Settle. Customize. Saks Fifth Avenue invites you to join us for the Fall 2008 Brioni Made-to-Measure Trunk Show. For more information, please call 212.940.2798. Don't Settle. Customize. Saks Fifth Avenue invites you to join us for the Fall 2008 Domenico Spano Made-to-Measure Trunk Show. For more information, please call 212.940.2798. Don't Settle. Customize. Saks Fifth Avenue invites you to join us for the Fall 2008 Saks Fifth Avenue Custom Shirts Made-to-Measure Trunk Show. For more information, please call 212.940.2798. Don't Settle. Customize. Saks Fifth Avenue invites you to join us for the Fall 2008 Kiton Made-to-Measure Trunk Show. For more information, please call 212.940.2798. Don't Settle. Customize. Saks Fifth Avenue invites you to join us for the Fall 2008 Mirus & Lautus Made-to-Measure Trunk Show. For more information, please call 212.940.2798. Don't Settle. Customize. Saks Fifth Avenue invites you to join us for the Fall 2008 Canali Made-to-Measure Trunk Show. For more information, please call 212.940.2798. Don't Settle. Customize. Saks Fifth Avenue invites you to join us for the Fall 2008 Ermengildo Zegna Made-to-Measure Trunk Show. For more information, please call 212.940.2798. Don't Settle. Customize. Saks Fifth Avenue invites you to join us for the Fall 2008 Hickey Freeman Made-to-Measure Trunk Show. For more information, please call 212.940.2798. Don't Settle. Customize. Saks Fifth Avenue invites you to join us for the Fall 2008 Oxxford Clothes Made-to-Measure Trunk Show. For more information, please call 212.940.2798. Don't Settle. Customize. Saks Fifth Avenue invites you to join us for the Fall 2008 Corneliani Made-to-Measure Trunk Show. For more information, please call 212.940.2798. Saks Fifth Avenue invites you to view the Alexander McQueen Fall 2008 Collection. Enjoy informal modeling 1 to 4. In addition, join us for a special preview from Alexander McQueen Furs Fall/Winter 2008 Collection. For more information, please call 212.940.2500. Saks Fifth Avenue invites you to preview the St. John Fall 2008 Ready-to-Wear Collection. 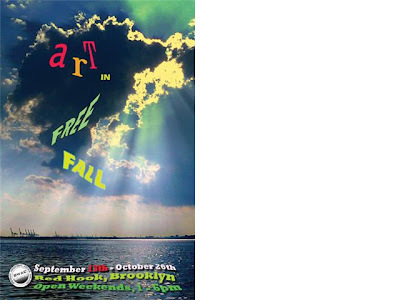 Enjoy informal modeling Thursday, September 11 and Saturday, September 13, 2 to 5. For more information, please call 212.940.2550. Saks Fifth Avenue invites you to preview the Oscar de la Renta Resort 2009 Collection. Enjoy informal modeling 1 to 4. For more information, please call 212.940.2508. Saks Fifth Avenue invites you to join us to view the Anna Maier~Ulla-Maija Bridal Trunk Show. Saks Fifth Avenue invites you to view the Cartier Jeweled Watch Collection. For more information, please call 212.940.2224. Saks Fifth Avenue invites you to experience a stunning showcase of exclusive fragrances, premiere cosmetics and skincare products. Join us for personalized fragrance consultations, luxurious facials and makeovers from some of the leading Guerlain National experts. For more information or to schedule an appointment, please call 212.940.4031. 6pm Universal Force Healing Center Jane MirshakFree Community Classes with Luke Ketterhagen at 10am and 7pm, Sadie Nardini at 4pm and product sampling sponsored by SOYJOY. It's official fall! The Chelsea galleries officially kick off the new season on Thursday, 9/4 with a number of openings. Click on the pictures and links for more information. Have fun and don't drink too much! Foley Gallery, 547 W 27th Street, 5th floor, 6:00-8:00 p.m.
Monkdogz Urban Art, 547 W 27th Street, 4th floor, 5:00-8:00 p.m.
NFL Opening Kickoff 2008 Presented by EA Sports on September 4th! The NY fashion week kicks off in a few days but only a few will get to see top designers and catwalks. New York Girl Style invites you all to a special ANIZE spring collection show on September 4th. Click on the invitation for all the details and have fun!